azzling color… intricate patterning… subtle variations in texture. Exquisite mosaic art that combines modern sensibility and Old World technique. Functional pieces that range from stylish contemporary to updated classic to cozy vintage. Inspired imagination plus quality craftsmanship and expert finishing for a piece of lasting beauty. Click on this image for a detail view. Click on this image for an enlarged view. Most styles in the Mirror Collection are available in a range of sizes and color harmonies, to complement your home or office. Decorative accessories and pieces in the Keepsake Collection and Venetian Table Collection are all one-of-a-kind or limited edition. Gallery and retail inquiries are invited. Custom work is my specialty, and I am delighted to consult with you or your interior designer on special projects that bring mosaic art into your living space. The designs you will see in the Gallery Tour are just a sampling of the work from my studio. 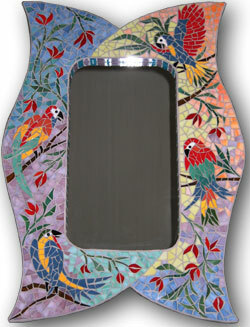 Each mosaic I produce is a fine handcrafted original. Studio materials include opaque stained glass, mirrored glass, vintage porcelain, and other distinctive bits and pieces I've collected. Tiles (called tesserae) are cut individually, using traditional glass-cutting tools, then painstakingly fitted together to achieve a luminous interplay of color, shape, pattern, and texture. Some pieces make use of furniture or functional objects discovered at flea markets and yard sales. 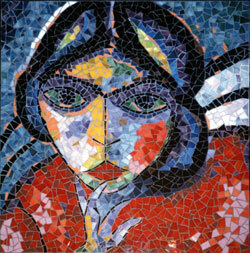 The very process of creating a mosaic, and the endless variations that occur naturally within in the materials used, guarantee that each work is unique. 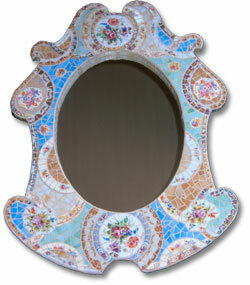 mosaic mirrors, mosaic tables, encrusted furniture, decorative accessories, signage.